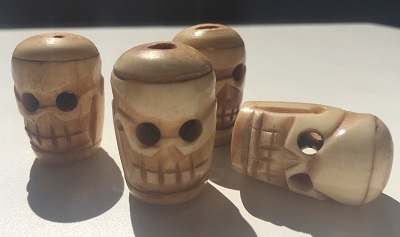 Vintage Bone Skull Bead Carving. Metaphysically bone energetically increases life span, reduces toxins, anxiety, and stress. Bone is said to balance the emotions, increase self confidence, and creates success in business. Bone enhances telepathy and stimulates the mind. Bone represent structure, time, eternity and evolution. Bones are the tangible remains left behind after the decay of flesh and serve as a reminder of the cycle of life. 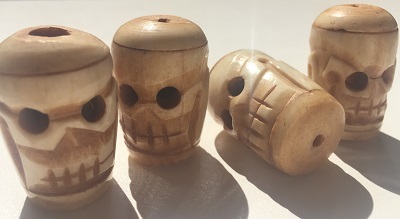 Bone is an excellent healing tool to work through past life situations and for releasing whatever no longer serves your higher purpose. 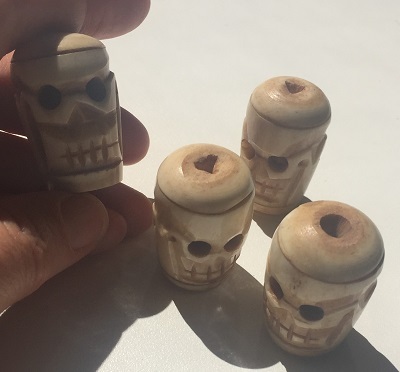 Bone is used as power tools by shamans throughout the world to journey between personal and transpersonal realms.